How can a young padawan like me build a website like this?!? I wanted to show my Star Wars collection on the Internet. So I asked Master Yoda to help me with a website. 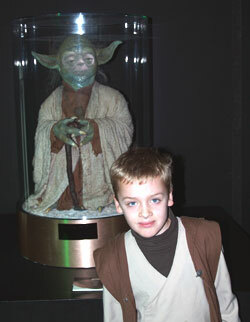 Yoda said: "Young Padawan, do this right, you must. Help you I can, yes. Making a website you can, but how will people find it? Many don't think, but just do. They build, but visitors don't come. If you do it like them, fail you will!" I said: "I don't want to fail, Master Yoda! I want a website that is seen by lots of Star Wars fans! Please help me, wise Yoda, what do I need to do?" Yoda sat me down again. "Impatient you are, young padawan! Before we build, know what people are looking for, we must... Yes, looking for Star Wars, I know. But is it Star Wars movies, or Lego Star Wars, or Star Wars action figures? How people find websites, know we must. What they type in Google, understand we must. Right?" "I'm sorry Master, I don't understand. How do we know what people type in the search box if we don't stand next to them?" He slowly moved his hands up. "Use the Force, young padawan. Remember, a Jedi's strength flows from the Force. 'Brainstorm It! ', we use. It's a big list, with terms people use to search. Ask all the search terms with 'Star Wars' in it. We do now." Yoda started to type on a monitor, and I saw a blue screen he had worked on many times before. "Brainstorm It! here is. Type in 'Star Wars' you do, and bring back all keywords with 'Star Wars', it will. Easy, huh?" After a while the screen showed lots of words with 'Star Wars' in it, and numbers behind it that I didn't understand. So these are the terms people are using to search for Star Wars on Google. "Ok! ", I said, "We know what people are looking for... can I get a website now?" Master Yoda smiled. "Patience... hard for you, I know. But look at these keyword phrases, and find the best we must. These numbers will reveal!" I looked at the numbers. This looked difficult! "This is difficult, Wijnand. Not expect young padawans to know this... My apprentice, you will be. Some Jedi Masters know this not. Help you with Brainstorming, I will. But the basics... you must understand. Here, look at sentences: "
"First number says, how many searches for that phrase. 'star wars galaxies', searched for 12,864 times it was. A lot of visitors we want, so build a page for a phrase that is searched for many times, we should. Makes sense?" I nodded. I scrolled down looking at the numbers, until I found the 'Star Wars'. It has the biggest number: 230,426! "Most people are looking for 'Star Wars' Will we build a page for that?" Yoda shook his head. "No. Found in the search engines, you should. And people look no further than first few pages. If lot of pages written for phrase, most will never be seen by people searching. And for 'Star Wars' lots there are!" Yoda typed in 'Star Wars' in Google. "See? 105,000,000 pages found for this sentence there are. Hard to get one of your pages on top it is... Look for sentences that many are using, but not many pages written for have been." "A sentence many are using here is, and has a lot less pages: 'star wars music'. Second number (666 for star wars music) shows how many pages are on Internet focussing on these words. Best terms have lots of searches and low number of pages built for that term.". Again I scrolled through the list, but soon the numbers were dancing before my eyes. Yoda looked at me and said: "Wijnand, brainstorming for you, I will. Strong am I with Brainstorm It! Young padawan must learn before a Jedi he can become. But remember you read a lot of books for school presentation, have you? Learn more about it, you needed, before talk about it, you could. Research you had to do. The same, this very much is. Learn about what people want to know about Star Wars. What they are looking for. Then build a great website you can." So he created a list of Star wars words for me, and now, each time I want to build a page, we look through this list and pick the next best one. But before I could build, I had to name the site... you know what I mean, the part between "WWW dot" and "dot COM". But there was a small problem. I wanted to use 'Star Wars' in it, like "Star-Wars-fan.com" or "I-love-Star-Wars.com". But Yoda said it wasn't a good idea. "A name many people earn lot of money with Star Wars is. Protected, is it not? So not anyone can use Star Wars and make lot of money. If Star Wars used in name, shut the site down some lawyer could. And do nothing about it you can." So we decided to use 'WijnandsGalaxy.com". So now I have my own website. I use Site Build It! to make it. SBI takes care of all the technical stuff. So don't ask me how it works, no idea. But it works. Let me show you how. For the page I use blockbuilder. It's not hard to build a page. It's like stacking LEGO blocks. After I found the keywords I want to use, I start by entering fields that are important for Google. It's important to have the keyword in each field, so Google knows what the page is about. Yoda teaches me that the title and description are important... People must become curious when readin the title, so they click on YOUR link and not someone elses. So I try to make the title interesting (not so good at it right now, but Master Yoda is a big help). I can pick a picture I've already used, or upload a new one. I take a lot of the pictures on the site with a digital camera, but I need help to fix them so they are not too large. I haven't learned that yet. And so I add text and pictures to the page until I'm ready. Then I check how it looks by previewing, and click on 'Analyze It!'. Analyze It! checks the page to make sure that Google understands what the page is about. Sometimes it tells me to add the keyword, and sometimes it tells me that I've used it too often. I just make sure that it says that everything is OK, so I have a better chance of getting higher up in the Google results! After building the page, it will automatically be added to my blog, the RSS feed (don't ask me what it is), and on the sitemap (apparently important for Google). And then Google gets a signal that I've built a new page. All this automatic! Recently I started a newsletter! That was very easy. I just gave it a name (I chose Wijnand's Galactic Gazette) and used the e-zine block. Now the visitor can enter the e-mail address and Site Build It! takes care of the rest! And when I want to send out a newsletter to my friends, I click on 'Send Message to List' and start building the message the same way as I did with blockbuilder. So this is how I do it. I hope you learned something as well. And do check out Site Build It! It's cool!!! CU at the Jedi school!